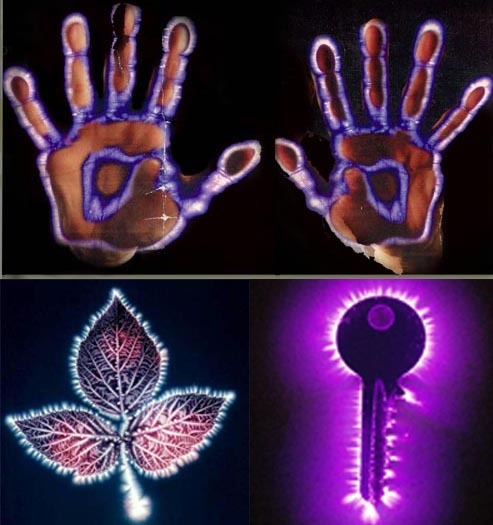 According to the Masters of Light, Kirlian photography does not take pictures of the aura, but only pictures of the energy field around objects and living beings, A machine capable to take picture of the aura has not been invented yet. There is an explanation of how they who take deceptively these pictures as if they were real pictures of the aura. CAN WE TAKE PICTURES OF THE AURA? Interlocutor: To conclude this session I want to ask you about two topics: cell phones (Can they produce damage?) and Kirlian photography. Ruanel: The cell phones or mobiles, in a smaller measure, they can produce noxious waves. Interlocutor: This is a matter that has not been yet solved yet has it? Ruanel: Correct. But the proportion of those noxious waves is small. With regard to Kirlian photography, it does not take pictures of the aura, but of an energy field, an ethereal body. The aura is a vibratory field that all living beings have and if Kirlian photography were used to take pictures of a rock or a coin, they would see that energy field, but not the aura, because rocks and coins are not living beings. Interlocutor: At the present moment Is there some machine (terrestrial) capable to take pictures of the aura? Ruanel: No, it has not been discovered. In the aura prevails the golden and yellow colors and the colors range to greenish. Kirlian photography only takes pictures of the green. Interlocutor: Does Kirlian photography have some utility? Interlocutor: Well. I’ll move on to the Camera Kirlian. But first I want to ask you if there are human beings capable to perceive the aura. Ruanel: The answer is yes, totally, because from the side of the sight, what is called "the corner of the eye", one can perceive very high vibrations than the normal eye perceives usually, to such point that one can perceive entities of the supra-universes. Interlocutor: Concretely, Are you saying that with the “corner of the eye” one can perceive spirits? Ruanel: Correct. For example, if you are writing in a dining room looking at the front and suddenly you see at your side something passing by, and when you focus your sight you don't see anybody. This happens because frontal sight doesn't have the vibratory perception of the side sight. With the corner of the eye you can see a vent fan at full speed, the twinkling of a fluorescent lamp light, etc. Interlocutor: I remember that in more than one opportunity Jorge has said it. Now that we are talking about this topic I’d like to know more about the name “Indigo Children”. We already know that Indigo Children don’t exist and it’s only a fantasy, but we know there are only prodigy children instead. what I want to know is if those who can perceive the aura see a blue or indigo color in these gifted children and they have given called in that way because of that. Ruanel: No, absolutely not. It is an arbitrary name that has nothing to do with any color they see on them. They could have been called “Brown Children” or “Yellow Children”, it doesn’t matter and it would have been the same thing. Ruanel: Definitely it is only nonsense a foolishness of the many they write in the newspapers, by people of New Age, regarding the “indigo Children”, “Hercolubus” or “Woodworm Star”, “Pleiades”, the “End of the World”. Interlocutor: I remember now what Einstein said about the human stupidity  and you brought it up when we began with the session. Ruanel: If there were “indigo Children” as they say in the internet, there would have been already scientists making tests on them, but everything has been on hands of charlatans. If the camera Kirlian doesn't have any utility, How can you explain that they took me accurate pictures? (Next to the image of the 'aura') they printed a paper with the seven chakras of my body and I had a problem of gastritis and another with my thyroid. My surprise was that in the chakra 3 and 5 (the 3 interacts with organs like the liver, stomach, etc., and the chakra 5 interacts with the part of the throat),I had 12 % blocked exactly those two chakras (I don't know how to explain it). A person explained me everything and he described me exactly the problems I had with 100% accuracy. A friend of mine who meditates is a healer also and when she examined me, she told me that I had problems in the chakra 3 and the 5 (And she didn’t see the Kirlian picture!). Finally, I was healed from my stomach problems and my thyroid, when no medicine was capable to help me. For that reason I tell you that I believe in these things. Everything went just fine. Regards Michel M.
Ruanel: There are people that have the gift of healing, you already know that. Ruanel: Well. The healers have the instinct of perceiving in which part of the body (the soma) the energies work badly, and they can be able somehow to improve the circulatory flow of the energies of the chakras. But that doesn't mean that if there is a real physical problem the body will be recovered completely. For that reason the medical part is always important. Not everything can be treated by means of energy healing. Interlocutor: How was this person healed? Ruanel: She didn't heal completely, but rather she was alleviated because her friend improved the energy flow which was blocked in the region of those chakras she said with a similar technique to Reiki. Interlocutor: With her hands or with some machine? Ruanel: Directly with the hands. Interlocutor: Okay, but what is not clear is that this person says that they printed the seven chakras on a paper. Ruanel: No, no, discard that completely, it’s false. Ruanel: That is a trick like the natal charts of Astrology, which are made by computer. The healer has those papers already prepared. Interlocutor: So, the pictures are already made? Ruanel: Correct. There are some charts more intense than others, and they add things according to how they perceive the patient is. Interlocutor: But it seems that this person who helped her guessed right in everything. Does she have some developed intuition? Ruanel: Correct, nothing to write home about. What happens is that they are helped by those printed papers to impress their patients. Interlocutor: I am remembering that a tarot reader once told me that he didn't need the Tarot cards to know things, but he used the cards because his clients believed more what he told them when he shuffled the cards on the table. Can this be applied to the case of this woman? Ruanel: It is a similar example. The client is dazzled and he thinks that the cards are the solution, when in fact is the tarot reader. Interlocutor: Concretely then, you ratify that the Kirlian photography and the Kirlian camera have no utility at all because they don't take pictures of the aura. Am I right? Ruanel: Correct. Only the healing is the one that helps. Interlocutor: Can human beings see the aura? Ruanel: Most of the children up to 5 years old can see the aura, they can see the elementals, and even some Angelic Entities. Interlocutor: Aren’t they confusing the aura with the energy field that surrounds all the living beings which is detected by the Kirlian Camera? Ruanel: No, not at all. The Master Johnakan said years ago, in several sessions that in the measure that the boy is educated, he loses the capacity to see the aura, he loses the capacity to see the elementals and he loses the capacity to see Angelic Entities. This vessel that houses me could always see the aura of the incarnated beings and the plants. Interlocutor: That is to say that if I requested him at this time that he sees my aura he can tell me, if I am angry, if I am anxious, or if I am making a role of victim? This entry was posted at Wednesday, November 25, 2009 and is filed under Medical Science . You can follow any responses to this entry through the .